1 package angelfood cake mix or cake of choice. Or purchase an already made cake in the bakery department. Bake cake according to package directions or recipe if making your own. Allow to cool completely. 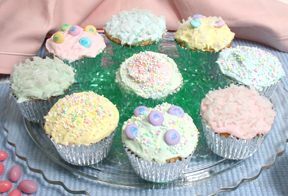 Mix frosting in a medium mixing bowl with food coloring to reach your desired color. Blue is shown in for this recipe but you can use whatever color you wish. Place the cake on a cake platter and spread a thin layer of frosting over the entire cake. This is called the crumb layer and will help keep the crumbs from showing through the next layer of frosting. Allow this to set for approximately 10 minutes. Meanwhile, in a small mixing bowl, stir together the coconut with the green food coloring until it is all combined and all of the coconut is dyed. Set aside. Spread a second layer of frosting over the entire cake. Try to keep this layer consistent in thickness and smoothness over the surface. Place a circular cut-out piece of cardboard (a large flat lid from a canning jar also works well) over the hole in the center of the cake. Frost over this as well, and smooth out. 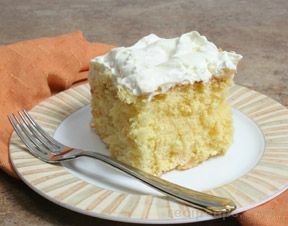 Using the tynes of a fork, start at the top of the cake and scrape a one-inch section through the frosting going down. Then, right next to that, scrape a one-inch section going sideways. Continue this pattern across the entire side of the cake to create a pattern that resembles a basket weave. Place the coconut on the top center of the cake to make a "nest." 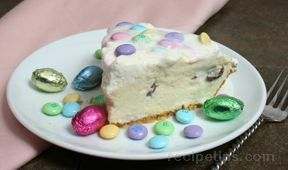 Place the malted milk balls into the nest. These will be the "eggs." Place the chicken Peeps on the outside of the nest. 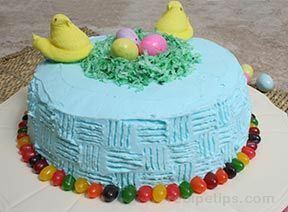 Next, line the bottom of the cake with jelly beans. Serve at your next Easter brunch or dinner.